New research by the Police Foundation and Perpetuity Research has looked at the police response to fraud and how it can be improved. Fraud is estimated to make up 31 per cent of all crime in England and Wales, with 3.24 million fraud offences estimated to have taken place in the twelve months to March 2018. 45 per cent of fraud victims felt that the financial loss they had experienced had an impact on their emotional wellbeing. 37 per cent reported a significant psychological or emotional impact. Yet despite the scale and impact of the problem, it is widely agreed that fraud and the harms it causes are not prioritised by the police. 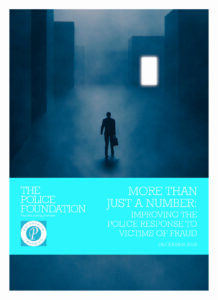 The Police Foundation and Perpetuity’s analysis of crime data and interviews with national and local practitioners found the system for dealing with fraud is poorly structured, fraud prevention messages are confusing and victim support services do not cater for the specific needs of fraud victims. and building a better system for tackling fraud. A national and a policing strategy to tackle fraud. Investigations conducted by dedicated fraud units. National force guidelines on services to fraud victims. A national framework for identifying vulnerable victims of fraud. Local forces to provide fraud prevention advice and outreach to vulnerable victims.